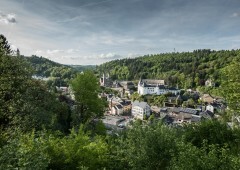 In the heart of the Ardennes, the village of Clervaux is adorned with a 15th century castle, a Roman church and a large monastery of the Saint-Maurice and Saint-Maur Benedictines. The castle stands proudly on a rocky outcrop, surrounded in a horseshoe shape by the village’s houses. The picturesque quality and natural setting of the village in the valley of the Clerve river have made it a very popular location for visits. 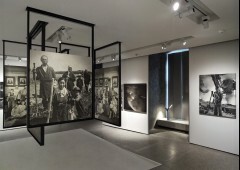 The old castle was wonderfully restored after its destruction in the second world war and is now a true witness of a prestigious past, showing interesting exhibitions, such as the remarkable collection of documentary artistic photos “The Family of Man”, by Edward Steichen.